When I started my job as a photojournalist at the Centralian Advocate I was expected to do "a little bit" of writing. Fast forward six months and I've just had a 1400-word feature published in the Sunday Territorian. It feels like a big achievement. The only reason I accepted the assignment was because of my wonderful subject: Sarah Brown and Western Desert Dialysis. The article was published in the lead up to the National Nursing and Midwifery Awards this week, which Sarah was a finalist in. I'm delighted to say that on Wednesday she was awarded 'Nurse or Midwife of the Year' at the awards dinner in Brisbane. Below is the article. Leanne Hudson wrote the introduction and edited the piece. If you feel inspired by Sarah and her organisation, I'd love for you to make a contribution to their latest fundraiser to help dialysis patients from Ernabella get back to their community so they can have the support of their friends and family during renal treatment. 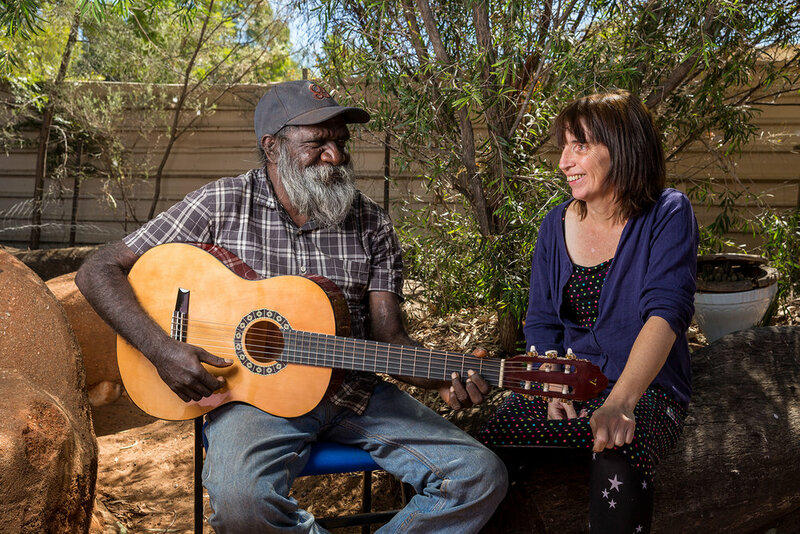 Beavering away in the bush is a colourful organisation that has helped thousands live the best life they can and stay connected to their community while dealing with a chronic disease. It started as an idea cooked up in the Territory desert, but has mushroomed into something much bigger. "Coffee time?” Kara Page calls from the kitchen to a packed waiting room. Her voice is just loud enough to be heard over an indigenous male singer crooning through the stereo. Someone places two freshly boiled eggs on toast next to her — a dish half the morning crowd is already eating. Faces are happy and the mood is jovial; it’s not what you’d expect from a group of dialysis patients with end- stage renal failure. That’s the magic of Western Desert Dialysis, or Purple House as it is affectionately referred to, thanks to the lilac walls of its centres. At Purple House, where Kara is executive assistant to CEO Sarah Brown, healthcare doesn’t stop with the clinical treatment of disease, but encompasses the entire treatment experience. The culture of Purple House was built from the ground up by Sarah — an inspiring nurse with a penchant for remote work and a heart as big as Uluru. These words were spoken by Deb Lillis, Director of Clinical Services at Western Desert Dialysis. She has dedicated 12 years of her life to the service after deciding to work in Alice Springs “for a year”. The only person with a longer association with the organisation is Ms Brown herself. Fourteen years ago she helped the Pintupi Luritja people set up the first remote kidney dialysis unit in Kintore, about 530km west of Alice Springs. Before then, the only option for desert people with kidney failure was to leave their families and communities — the things most important to them — to have life-extending dialysis in Alice Springs. Fed-up with seeing their elders disappearing from country for treatment, the Pintupi Luritja people decided to come up with a solution themselves. The group united artistic talents from across the Western Desert to create spectacular collaborative paintings they auctioned off at the Art Gallery of NSW. They raised $1 million to set up their own dialysis centre. All they had to do next was find the right person to help them. At this time Sarah Brown was living by the sandy shores of Cape Barren Island, working as “the nurse” for the Bass Strait community. After hearing about the auction she rang a contact from her days previously working in Kintore, to check the group’s progress. “He said, ‘They’ve advertised for a part-time manager in Alice Springs; 20 hours a week at $20 an hour. You interested?” she said. The decision was a no- brainer for Ms Brown, who packed her bags and landed in the dusty Red Centre ready to make dialysis in the bush a reality. It proved more difficult than she first thought. “There was an existing way of delivering dialysis in the Territory, which was run by the government, and suddenly this group from the most remote part of Australia turn up and say ‘we’ve got money and we want to do this ourselves’,” she said. The secret to entwining the two worlds came from a willingness to honour the cultural needs of patients. Each centre and its services are customised to the desires of the community it serves, rather than a “McDonalds dialysis” approach. After much consultation and hard work, the first Western Desert Dialysis units in Kintore and Alice Springs opened in 2004. To the surprise of everyone, 14 years later the organisation has grown remarkably, providing dialysis in 11 locations in the NT and WA, with their first South Australian unit in the pipeline. There is also the famous Purple Truck — a portable dialysis centre that visits communities where the organisation is yet to set up shop. Looking back, Ms Brown said it’s been a hell of a ride. “There’s this analogy I have about driving along a bitumen road to a community and driving along the bush track,” she said. Sarah’s role at Purple House is all-encompassing, from meeting with government officials and developing strategy, through to carrying out the humblest elements of patient care. “She gives a good massage, and she’s really good at cutting my toenails,” laughed dialysis patient Quentin Walker Jurrah. Such is the volume and ferocity of Sarah’s work, Deb Lillis said she often likens her mentor to a “lovely tornado”. “She makes all of this incredible stuff happen, and we just get swirled up in it, and get the pleasure of being involved in it,” she said. The sad underbelly of Purple House, and the reason the organisation exists, is the alarming rate of kidney failure in desert communities — between 15-30 times the national average. Reasons for the disparity are varied: some blame high blood pressure and diabetes, others a lack of good nutrition. Some believe it’s sub-par housing. One myth Sarah Brown is keen to dispel is that grog is the culprit. “Alcohol is not a major cause of kidney disease,” she said. “Most of the mob who are our patients live in dry communities and have never touched a drop in their lives. In addition to quelling misconceptions, another aspect of her role is advocating for the rights of her patients, or potential patients, as was the case with prominent Kiwirrkurra artist Patrick Tjungurrayi. In 2009 Mr Tjungurrayi, living a hop, skip and jump over the WA border, was in need of kidney dialysis, but renal centres in the Territory were swamped, leading the government to close its doors to interstate patients. “There was a dialysis unit 150km away from Patrick in Kintore, but because of the policy they wanted to fly him 2600km to Perth for treatment,” Ms Brown said. “Patrick couldn’t be that far away from his family; he’s a senior man for Kiwirrkurra, an incredibly important cultural man for a big whack of Western Australia, and he’s one of Australia’s 50 most collectable painters. Although advocacy work sometimes feels like “Chinese water torture”, Sarah happily takes it on as a matter of life and death. “We had to keep moving or Patrick would have died,” she said. “We were out there every day with something in the media — drip, drip, drip. If it seems like she takes these predicaments personally, it’s probably because she does; in the world of Sarah Brown, her patients are like family. “They talk about ‘professional barriers’ and not getting involved, but that was never going to be me,” she said with a smile. “That just feels like you’re skating across the surface of life, trying to hope that nothing affects you or touches you. Despite her profound influence on the lives around her, she is coy about accepting credit for her work, and plays down her chances of being named ‘Nurse or Midwife of the Year’ in the HESTA Nursing and Midwifery Awards next week. One suspects it’s this humility that makes Ms Brown the phenomenal caregiver she is, and a deserving recipient if her name is called out at the awards dinner on Wednesday evening. Congratulations for making it to the end! Here's the donation link again incase you're feeling generous: make a contribution.